The University of Minnesota, Morris (UMM) is one of five campuses that make up the University of Minnesota System. Located in western Minnesota, it provides a unique learning environment as an intentionally small, residential university focused on providing an outstanding liberal arts education. 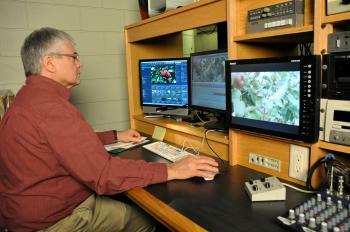 One of the growing departments on campus is Instructional & Media Technologies. The department has a video production lab with 12 fully equipped workstations where students learn the fine art of video production and editing. More importantly, the department has a complete broadcast studio where many television projects are produced throughout the year directly for broadcast. The department produces college promotional videos, documentaries, and research-based video projects, but is probably best known for Prairie Yard and Garden. The program is a weekly gardening program, airing October through April on Pioneer Public Television (KWCM). The program reaches over 375,000 households in west central and southwestern Minnesota, eastern South Dakota and northern Iowa. Prairie Yard and Garden has consistently been ranked as one of the most popular programs on Pioneer Public Television out of its 200 regular scheduled programs. Cihak added, “The media server is used by both the broadcast studio for the professional productions and by the students for their lab work. It needed to be write protected and have permission based accessibility so that data could be easily shared among students and faculty.” Working again with Whitten at Alpha Video, the university purchased an EditShare Storage System with 16 Terabytes of storage. “This system gives us user-level management of disk space. All of the media students receive an account and about 200GB of media space. They also have access to the class media space so they can easily share assignment files with the professor. It really makes it much easier to manage the server. The department’s broadcast production workflow begins with shooting the interview and cover video shot on location using the Panasonic camcorders. The data on the P2 cards is brought into the edit suites and copied to the EditShare system into a project space. The P2 data is then ingested into CatDV. As the video is being ingested, CatDV records the metadata assigned to the shot and puts every thumbnail into the database. The department also goes through the clip and assigns additional metadata fields. 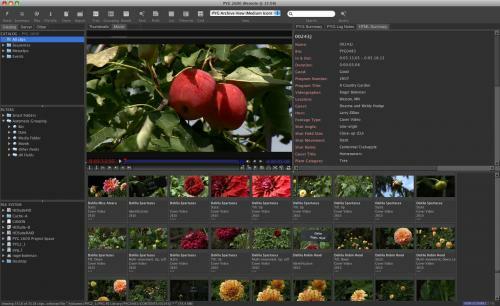 For example, the Public TV horticulture program uses 40 metadata fields. The staff can define one video clip of a flower blooming by the type of flower, color of the bloom, type of shot, cameraman, etc. Once the editing begins for a program, CatDV is the main search engine for data. As clips are brought into Final Cut Pro, the CatDV metadata fields are automatically dropped into the 15 mapped fields for Final Cut Pro and the clips are assigned to a bin. Once editing is completed, the finished program is placed back into CatDV as a QuickTime file.